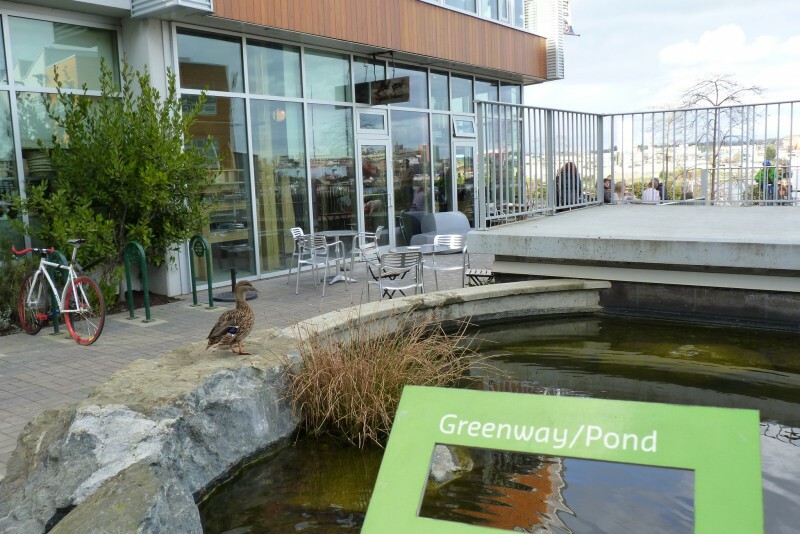 The case of Dockside Green in Victoria, a mixed-use development built in 2011 on an abandoned dockyard, is helpful in illustrating how cities are parts of larger systems, such as environmental, economic and social interactions. A systems-thinking approach to understanding cities is based on ecological notions of interconnections. With this perspective, cities are as a series of interrelated social, economic and ecological processes that are in constant interaction and motion. Dockside Green, for example, was financed by a local credit union known for innovative and socially conscious investment strategies. This means that it had the dual goal of creating a healthy community and contributing to a healthier environment. The aim of Dockside Green was to create a community that takes into account environmental, social and economic sustainability, and it is based on new urbanism principles (Figure 1.7). 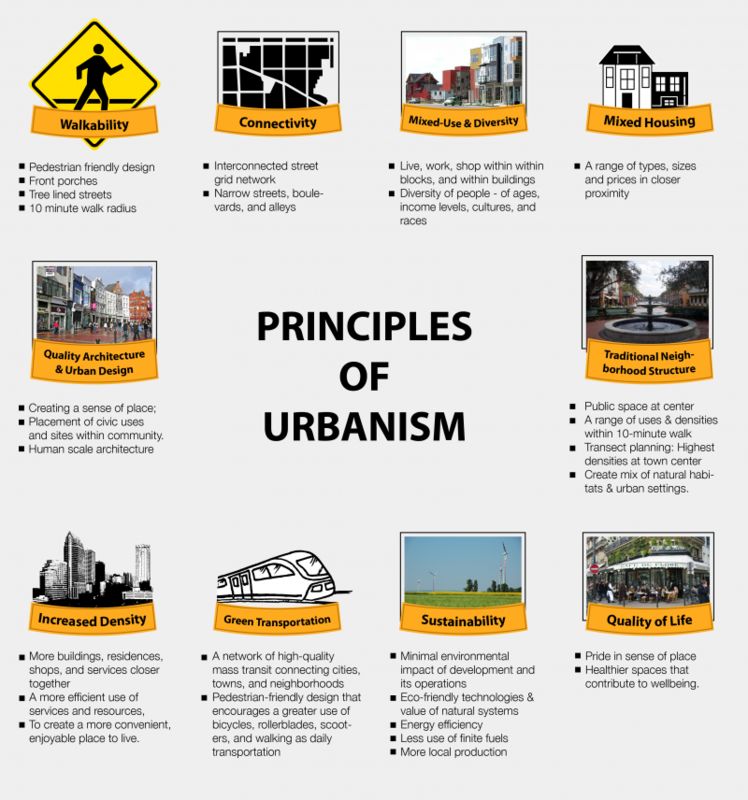 These principles include, connectivity, sustainability, walkability, traditional design, increased density and mixed-use structures. Before construction could begin, the brownfield site needed extensive environmental remediation at an estimated cost of $12 million. The surrounding community demanded significant input into the waterfront redevelopment because the Gorge Waterway, a saltwater inlet traveling through the city of Victoria, is ecologically important, containing eelgrass beds which are some of the most diverse and productive ecosystems in the world. The beds provide key salmon habitat, act as a nursery space for thousands of marine species, prevent erosion and are a direct food source for migratory birds. The Gorge Waterway also provides Dockside Green with waterfront real estate, increasing the land value of the development. The design that was chosen for Dockside Green operates under LEED neighbourhood development principles. 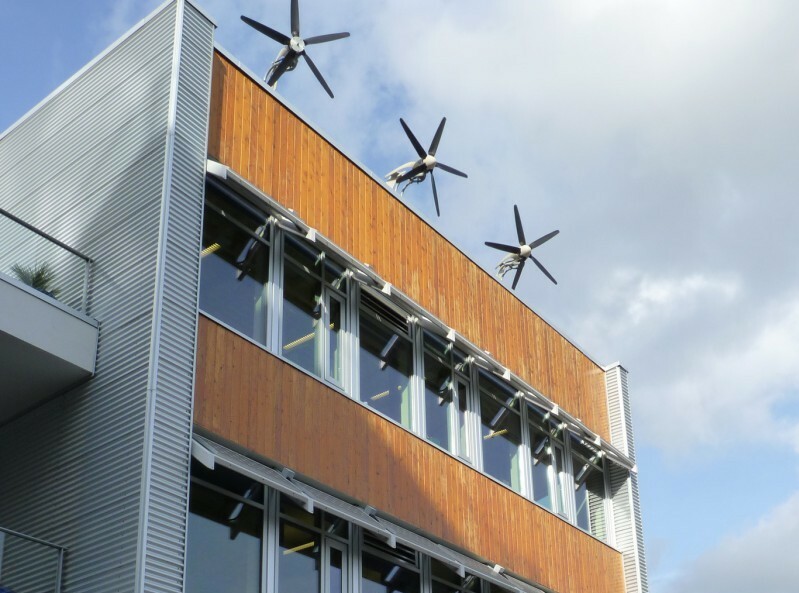 LEED, or Leadership in Energy and Environmental Design, is a certification system for green building construction. Housing affordability is a major concern in most Canadian cities, and while Dockside Green has been successful from an environmental sustainability perspective, it has been less so from a housing affordability perspective. Dockside Green is located in Victoria West, a traditionally low-income community in the city. The provision of social housing units was much less that what had been originally proposed in the project, and the main focus on housing affordability was for people making $30,000 to $60,000 a year. Many of the units provided were one- and two-bedroom social housing units, which are generally not appropriately sized for low-income families with children. So, while the development has been successful in creating an environmentally high quality of life for its residents, it has been less successful in creating social inclusion. Grafton Street, Dublin (http://en.wikipedia.org/wiki/Dublin#mediaviewer/File:Grafton_St,_Dublin.jpg) by Donaldytong (http://commons.wikimedia.org/wiki/User:Donaldytong) is under CC BY SA (http://creativecommons.org/licenses/by-sa/3.0/). Wind turbine with observation deck bruck an der leitha (http://commons.wikimedia.org/wiki/File:Wind_turbine_with_observation_deck_bruck_an_der_leitha.jpg) by KoeppiK (http://commons.wikimedia.org/w/index.php?title=User:KoeppiK&action=edit&redlink=1) is under CC BY SA (http://creativecommons.org/licenses/by-sa/3.0/). Tampa Florida November 2013 (http://en.wikipedia.org/wiki/File:Tampa_Florida_November_2013-2b.jpg) by Alvesgaspar (http://commons.wikimedia.org/wiki/User:Alvesgaspar) is under CC BY SA (http://creativecommons.org/licenses/by-sa/3.0/). 1784 Plan of the City of San Francisco of Quito (http://commons.wikimedia.org/wiki/File:1784_Plan_of_the_City_of_San_Francisco_of_Quito.jpg) by Jorge Juan and Antonio de Ulloa (Ortiz, Alfonso 2007, Damero, FONSAL, Quito.) is under Public Domain. 022306-CelebrationFL11 (http://en.wikipedia.org/wiki/New_Urbanism#mediaviewer/File:022306-CelebrationFL11.jpg) by Bobak Ha’Eri (http://en.wikipedia.org/wiki/User:Bobak) is under CC BY SA (http://creativecommons.org/licenses/by-sa/2.5/). Prospect New Town in Longmont, Colorado (http://en.wikipedia.org/wiki/New_Urbanism#mediaviewer/File:DSCN3187_prospectnewtown_e_600.jpg) by Decumanus (http://commons.wikimedia.org/wiki/User:Decumanus) is under CC BY SA (http://creativecommons.org/licenses/by-sa/3.0/). Café de Flore (http://en.wikipedia.org/wiki/Coffeehouse#mediaviewer/File:Caf%C3%A9_de_Flore.jpg) by Arnaud 25 (http://commons.wikimedia.org/wiki/User:Arnaud_25) is under Public Domain. Case Study 2: Dockside Green, Victoria by Geography Open Textbook Collective is licensed under a Creative Commons Attribution 4.0 International License, except where otherwise noted.